LR3 I can't get the adjustment brush to work! It was working before. But now it is not working. Please help. What is not working, can you elaborate a little more? Have you made sure you've set flow, densitiy and size to reasonable levels? Do you have one of the adjustment sliders set to something other than zero "0"? A flow and density of 25 means very little is going to happen initially, and it's going to take a lot of going over a spot to build up to 25% of the amount you have set in the sliders. I agree with Lee Jay, to see if it works at all, set flow and density to 100 and exposure to +4 or -4. I set flow and density to 100 and exposure to +4 . Nothing guys. I figured it out. Rookie misstake. I was working on bad files. I tried another set of photos and it works fine.I have a lot to learn. Thx Beat and Jeff for your time and interest. hello. im having the same problem. my adjustment brush doesnt work. i tried with different photos, adjusting the exposure etc, but still it doesnt work. help me pls anyone? Can you give more specifics about what does not work and what exactly your steps are? I'm using LR 2.7 on a Mac 10.6.8 os. Have had nooo problems, until yesterday, when the brush tool in LR stopped working. I went over an area to lighten it, and no adjustments can be made with any of the sliders. I've changed nothing: no preferences, etc. This is a random occurrence, but I cannot get it to work! My "density" on the brush was set to "minimum". I don't know how that got changed (I never touch it), but it did, and I finally noticed it! Hope all your problems are solved as easily today! I'm posting this for the benefit for others too - I'm using Lightroom 5. Indeed my DENSITY brush was automatically set to minimum. I've set it back to MAXIMUM and it works. I have a problem with my adjustment brush too. 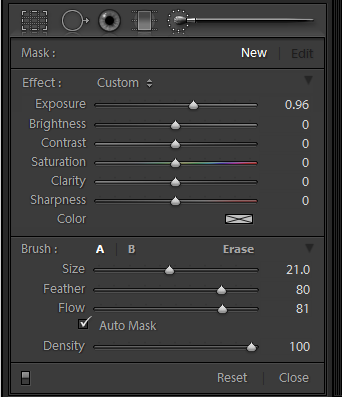 I am using lightroom 5.6 on mac os 10.9.3 and the brush is not dropping the pin, therefore I can't do any adjustments. It was fine until two weeks ago. If I restart Lightroom it works fine for 2 images and then the same thing happens. I did the update to 5.6 but with no results. Thank you for your reply, BUT ! I logged on this morning and the problem was still there, so I thought TAKE IT OFF and reload. I clicked on to applications to do this but I thought just have peep to see what is in the LR folder. I decided not to take it off and had a look at LR again at the adjustment brush and it worked !!!!!!! It hasn't done this for so long ???? Whatever I did or didn't do it is working. !!! Have a good day. A friend of mine has the same LR 5.6 and he has a density box to tick but I haven't ! Mine is a slider. How bizarre is this. We both have a Mac OS X ( Yosemite ). There is a check box above it but it is for the Automask function not Density. I am glad to hear your brush is working again. Thank you so much for your responses - I am so impressed !!! Glad I joined - thank you once again. Oh, yes, I did notice the auto mask box .